Helen Frankenthaler (American, 1928-2011) was one of the most important American artists from the early 1960s until her death in 2011. One of the early abstract expressionists, she was also a pioneer (along with Jules Olitski and Morris Louis) in the development of color-field painting. In addition to her achievements as a painter, she is also a major printmaker, whose works have been featured in many shows, including a print retrospective at the National Gallery of Art (memorialized in a catalogue published by the National Gallery) and was recently the subject of an important catalogue raisonné of her prints. For two of her recent prints, see Frankenthaler Special, which will take you to Southern Exposure, a 51-color screenprint that sold out the day it was offered to dealers and currently had a suggested retail price of $7500 on Lincoln Center's dealer's price list, following in the footsteps of Flirt, a 42-color screenprint published by Lincoln Center that sold out the day it was first offered to dealers and has since sold at auction for $9000 and $14,000 (we sold two impressions for under $5000 each when it first appeared), and Solar Imp, also published by Lincoln Center that also sold out on its release day to dealers; we have one left for $9000. Selected Bibliography: General works: Julia Brown & Susan Cross, After Mountains And Sea: Frankenthaler 1956-1959 (NY: Guggenheim Museum, 1998); E.A. 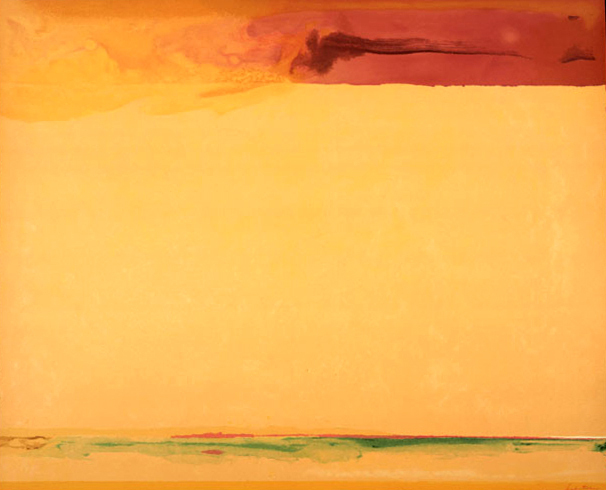 Carmean, Jr., Helen Frankenthaler: A Paintings Retrospective. NY: Harry N. Abrams, 1989 (This exhibition was organized by the Museum of Modern Art in Fort Worth, Texas and traveled to MOMA and three other locations); John Elderfield, Frankenthaler NY: Abrams, 1989; E. C. Goossen, Helen Frankenthaler. New York, Whitney Museum of American Art, 1969; Barbara Rose, Frankenthaler. NY Abrams, 1970; Karen Wilkin, Frankenthaler Works on Paper 1949-1984. New York: George Braziller, Inc. 1989. 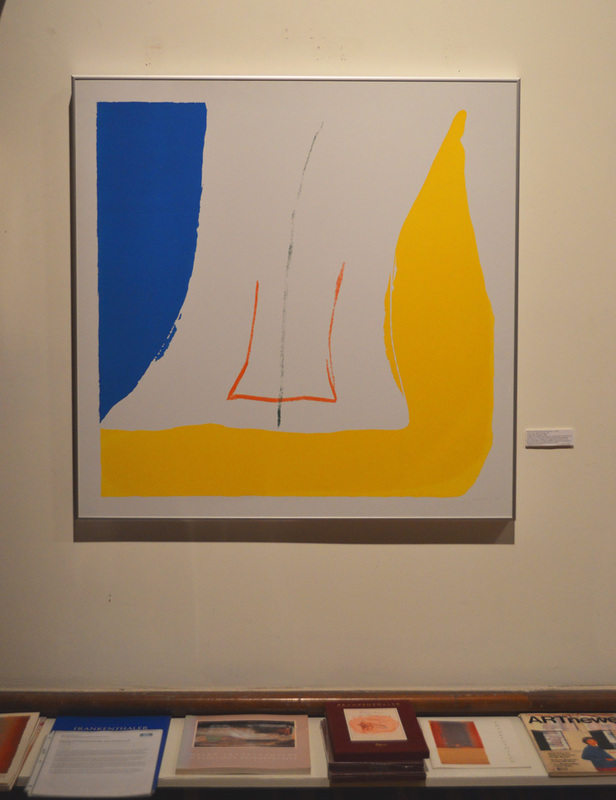 Prints: Ruth E. Fine, Helen Frankenthaler: Prints. Washington, DC: National Gallery of Arts, 1993; Steve Afif, Helen Frankenthaler (Barcelona: Ediciones Poligrafa, S.A., 1988; Pegram Harrison, Frankenthaler: A Catalogue Raisonné. Prints 1961-1994. 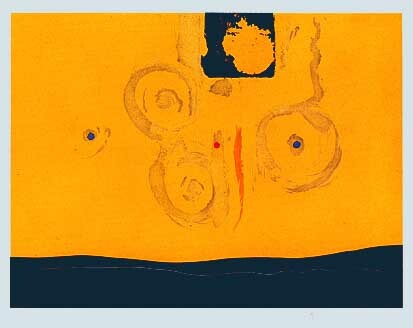 NY: Abrams, 1996; Thomas Krens, Helen Frankenthaler Prints: 1961-1979. NY: Harper & Row, 1980 (her first print catalogue raisonné, based upon a retrospective at Williams College). Air Frame (6). Original color screenprint, 1965. 200 signed & numbered impressions + 25 impressions H.C. for contributors (numbered A/Y-Y/Y) for the portfolio, New York Ten. A fresh impression of the artist's first serigraph. Small handling crease lower left corner otherwise very good condition. Image size: 558x430mm. Price: SOLD. Helen Frankenthaler (American, 1928-2011), Sun Corner (HR 13, Harrison 12). 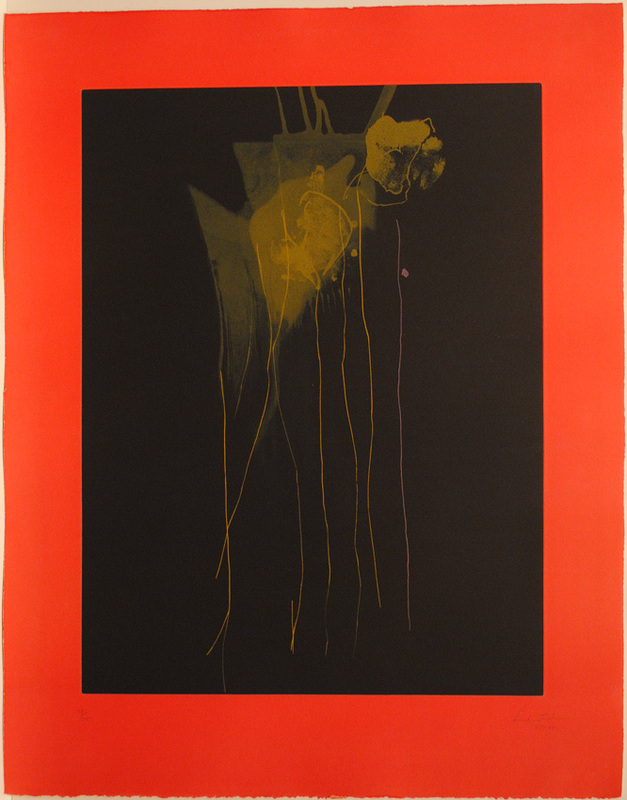 Original color silkscreen from 4 screens (printed in yellow, red, green, and blue, 1968. 50 signed & numbered impressions (of which ours is n. 17/50) on baked aluminum panel. There were also 2 artist's proofs, 10 lettered artist's proofs numbered A-J, and several unnumbered artist's proofs on Arches paper. The work was published by Tanglewood Press, Inc. in NY City and was part of The Metropolitan Scene portfolio, a traveling folding art display organized by the Education Department of the Metropolitan Museum of Art in 1968. Image size: 914x914mm (36"x36"). Frame size: 36x36 inches. Price: $12,500. The panels were originally mounted on a heavy honey-comb paper base and traveled in plastic frames; at some point, the plastic frame was damaged and the paper backing was removed along with the broken frame. The screenprint itself is in perfect condition and the work is now framed in a silver metal frame without glazing. It is also currently on display as part of our show of "American Works on Paper, 1960 to the Present." Spoleto (Harrison 37). Original 5-color silkscreen, 1972. 100 signed & numbered impressions on Arches published by the Spoleto Festival Foundation and printed by Patricia Yamashiro in NY. The work was commissioned for the Spoleto (Italy) Festival of the Two Worlds. There was also an unsigned poster with text. Image size: 1003x749mm (40"x30"); framed: 48x36 inches. Price: SOLD. Cleveland Orchestra (Harrison 70, Williams College 68, Tyler 193). Original 8-color screenprint, 1978. 150 signed and numbered impressions (of which ours is n. 42/150) plus xxv signed and numbered artist's proofs on white Arches cover paper printed at Tyler Graphics in Bedford Village NY. 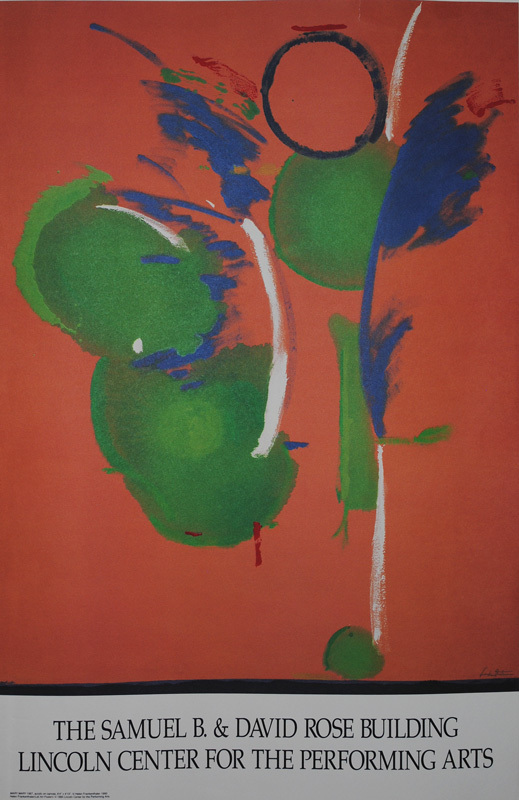 This print was created as a fund-raiser for the Cleveland Symphony Orchestra, whose logo is printed underneath Frankenthaler's signature. "To achieve the brushstroke marks that give the print its painterly quality, the artist drew directly on the screens with liquid tusche. This method of screenmaking allowed her the gestural freedom that is not available in either the hand-cut film process or the photo-stencil methods" (Williams College, p. 134). One of Frankenthaler'smost painterly prints. Image size: 560x760mm. Price: $6500. 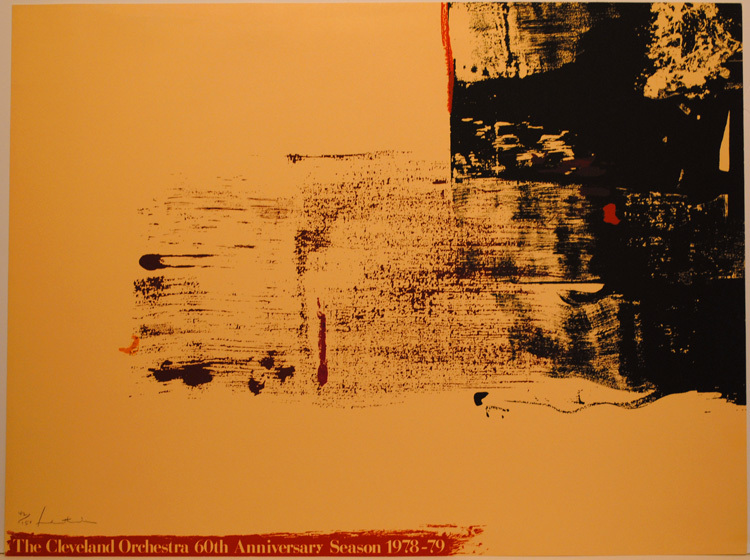 See below for image as matted: by signing above the Cleveland Orchestra logo, Frankenthaler seems to acknowledge that some might prefer a logo-free view of the work. Ramblas (Harrison 141, Afif Prints 3). Original 6-color etching, drypoint, and lithograph, 1987-88. Edition: 75 signed and numbered impressions on Rives (of which ours is n. 29/75) plus 16 artist's proofs and 2 printer's proofs. Image size: 870x686mm (34-1/2x27 inches). Price: $15,000. In 1987 Frankenthaler accepted an invitation to come to Barcelona and work with master printer Joan de Muga at Ediciones Poligrafa. 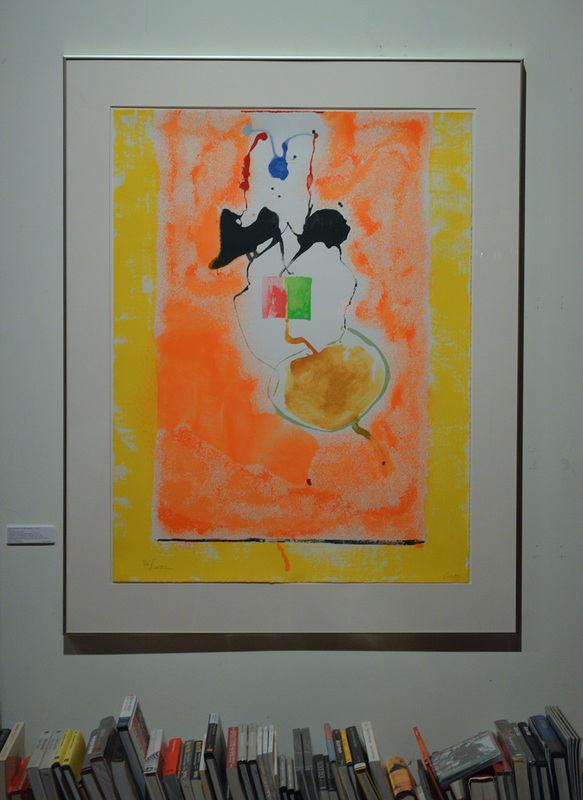 During a 10-day period Frankenthaler began 4 mixed-media works combining lithography (four aluminum plates) and etching and drpoint (one copper plate). 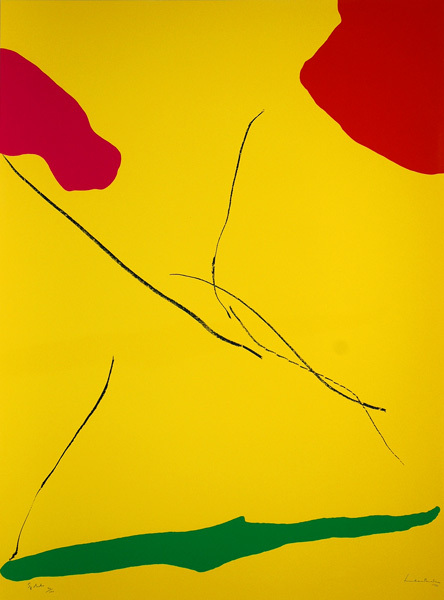 Joan de Muga made 6 visits to Frankenthaler's studios in New York and Connecticut in the following months bringing proofs; Frankenthaler made corrections and gave precise instructions on the way she wanted them printed. The edition was printed after she was finally satisfied with all of her changes. 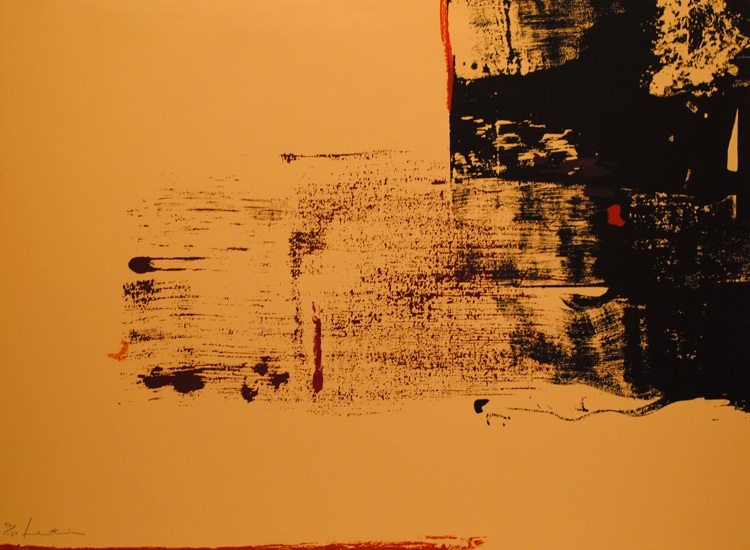 The result is a large (we have it matted in a 44x36 inch museum-board mat), rich, complex, and beautiful work.The signed and numbered impressions were sold by Galeria Joan Prats; the artist's proofs were Frankenthaler's. Mary, Mary. 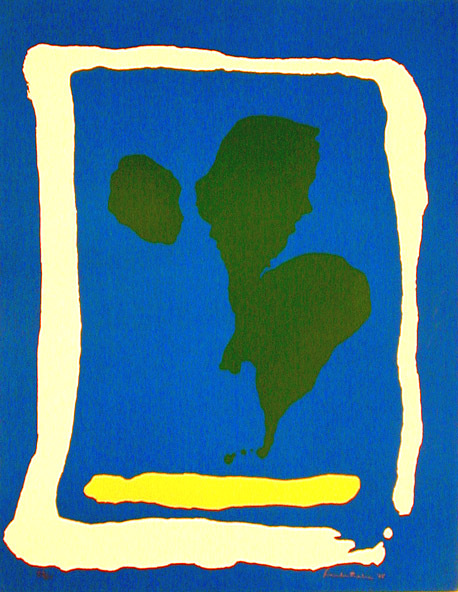 Original 4-color screenprint and photolithograph, 1990. 72 signed and numbered impressions plus 9 artist's proofs.Published by Lincoln Center. There is also an unsigned poster with text. 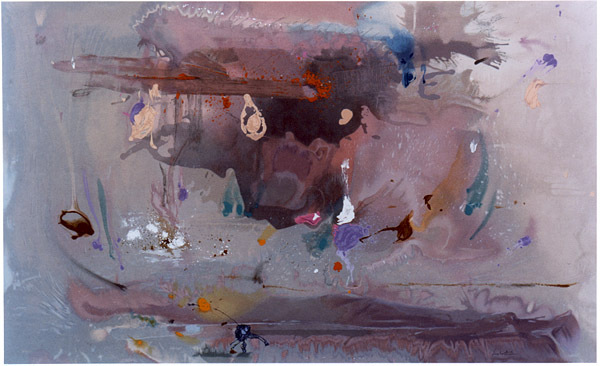 Based upon Frankenthaler's painting, Mary, Mary, this work was commissioned to commemorate the opening of the Samuel and David Rose Building at Lincoln Center. Image size: 1070x812mm. Price: SOLD. Grey Fireworks. Original 63-color silkscreen, Feb. 2000. Edition: 108 signed and numbered impressions on Somerset Textured rag paper plus 18 artists proofs. Small triangumar handling crease lower left corner c, 1" long and 1/4" maximum height. Image size: 710x1168mm (28"x46"). Price: SOLD. Still available: the original poster made from the same screens at the same time by Lincoln Center's printer. Edition: c. 800 posters with lettering (as here), of which about 300 were used by Lincoln Center for display at the time. Image size: 710x1168mm (28"x46"). Mat size: 36"x54." Price: $1000. 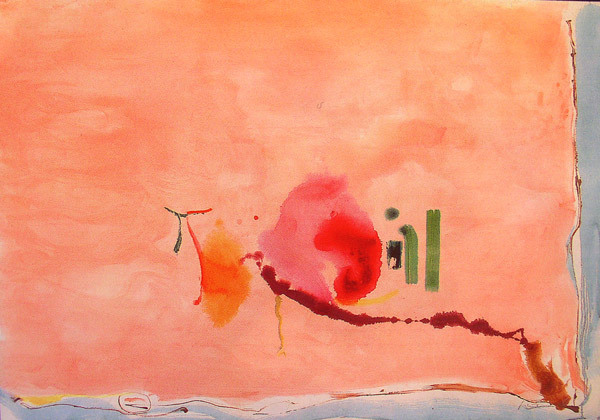 Helen Frankenthaler (American, 1928-2011), Solar Imp. Original 35-color screenprint, 2001. 126 signed and nummbered impressions on Somerset Textured Rag paper, of which this is n. 71/126. There were also 18 artist's proofs. Commissioned by Lincoln Center for the Performing Arts to help support the programs at Lincoln Center. In addition to the signed and numbered edition, there was also an unsigned poster edition with a printed textLincoln Center Salutes New York CIty Ballet of about 800, 300 of which were used at Lincoln Center to advertise programs at the Center. Illustrated on p. 191 of Art at Lincoln Center: The Public Art and List Print and Poster Collections (2009). Image size: 1000x760mm. Mat size: 48x38 inches. Price: $9000. Southern Exposure. Original 51-color silkscreen, hand-screened at Brand-X Studios, September, 2005. Edition: 128 signed and numbered impressions on Somerset Textured rag paper plus 18 artists proofs. Signed in the screen lower right, signed and numbered in pencil lower left. Image size: 774x940mm (approximately 30.5"x37). Price: SOLD.